Food – food access, food quality, food production – is one of the defining issues of our age. The rapid growth of local food movements provides a creative and essential conversation that links the revitalisation of rural economies, food access for urban areas and the health and well-being of all our communities, national and international. This is important because, as Martin Harper of the RSPB said at the 2012 Oxford Farming Conference, globally, agriculture is facing unprecedented pressures over the coming decades. Global population currently stands at seven billion people, and is predicted to rise to over nine billion by 2050. However, the global system is failing in two major ways: hunger remains widespread, a billion people are malnourished, yet a billion people are risking damage to their health by over-consuming. Second, many systems of food production are unsustainable, degrading the environment and compromising the world’s ability to produce food in the future. Human beings are the most significant entities in the universe. Our geographic imprint in recent times is now influencing every aspect of the Earth on a scale akin to the great forces of nature. Because there are now so many of us, using so many resources, we’re disrupting the grand cycles of biology, chemistry and geology by which elements like carbon and nitrogen circulate between land, sea and atmosphere. This new age is being called the anthropocene. It comes from the Greek anthrōpos meaning ‘human being’ and kainos meaning ‘recent.’ This age has been ushered in just over the last 200 years. However there are some who argue that its roots go much earlier. The American medieval historian Lynn White said in his 1967 essay titled, The Historical Roots of Our Ecological Crisis [1967 Science 155: 1203-7] that the crisis lies not in what the Bible says about our relationship with the natural world, but what we have taken the text to mean at certain periods of history; how it has motivated certain activities: and how it has come to sanction a particular attitude towards nature. White bases his case largely on what happened in the Middle Ages. He says that the introduction of the heavy plough in mediaeval times made the large-scale cultivation of land possible and lifted agricultural production above the level of subsistence farming. This technological innovation revolutionised the relationship between human beings and the land. In the medieval period, an understanding of God in creation reflected contemporary debates over humankind’s position in nature. It was not a scientific view of nature. It was one which found in the cosmos a moral and theological order and located human beings at its centre. There were other voices in the Middle ages. St Francis of Assisi is known for his framework of a theologically infused way of living. The lives of the Franciscans and the Poor Sisters of St Clare were dedicated to the life of the spirit and their spirituality emphasised the intrinsic value of nature. And there were the Benedictines, who united worship and labour. On the whole medieval attitudes toward labour and nature, were positive but hardly enthusiastic. Farming was still hard work. It was undertaken by a feudal society in which land, woods and water were managed collectively. In the late Middle Ages, social changes and tensions caused by poverty and disease broke down the complex, formal structures of society and city. As the medieval economy grew, ancient forests were no longer chopped down to drive out pagan spirits or to make room for settled monastic communities and agriculture. Instead they were clear felled for ship building, driven by growth in international trade. Following the Protestant Reformation the medieval world was turned upside down. And the scientific observations of Copernicus displaced the earth from the centre of the universe and called into question the privileged place of the human race. A new narrative to describe mankind’s dominion over the land had to be found. Francis Bacon started to develop his theories in the natural sciences. Nature had to be removed from its curse. It should not be left in its fallen state but experimented with, manipulated and improved and mankind’s dominion restored. By the seventeenth century, new sciences were developing agriculture and husbandry, and landscape gardeners controlling nature. Age of Enlightenment philosophy and its accompanying scientific revolution finally subjugated nature to the control of the rational mind, severing it from the roots of its scriptural and theological inheritance. So the medieval moral view of the world was replaced by a mechanistic one, a collection of self-interested individuals operating the world as an objective machine, no longer for the common good. more serious. The global economy is unravelling and we are in an environmental crisis. International efforts to avert the gathering perfect storm seem doomed to fail and national targets to tackle climate change are being missed who else can drive forward the green agenda? We are left with civil society of which the churches are a significant part. How should we respond? How confident are we that we can adapt religious teaching to the task of revaluing nature to prevent its destruction? How can we as church get engaged in issues affecting food, sustainable energy, restoration, and urban environmental management? One way of becoming more active in civil society is through the network of environmental organisations. Some are faith based such as aRocha UK, Christian Ecology Link, EarthAbbey and Ecocongregation Scotland; helping members to understand and relate these responsibilities to their faith, so that we as individuals within civil society can confront the politicians, to ensure that responsibility at local, national and international level is not diluted. The other way that churches can be involved is through our liturgy. It is important that we continue to give thanks for those who plant and grow, pick and transport the first fruits of what we enjoy today, even if the link with the liturgy of Deuteronomy is becoming more tenuous because the sense that everything is a gift from God has all but disappeared. Liturgical practice expresses a fundamental connection with structures of meaning and value in the universe, time and seasons. What was revived as a Victorian traditional service of the harvest has grown into a global ecumenical movement focusing on care for creation. Our personal spiritual life is another key area. I mentioned St Francis earlier. The Franciscan way is a way of seeing our world that is different from our own but not in a world denying way. In a world affirming way. For St Francis the entire universe – the self and the total environment to which the self belongs – is a theophany, in other words, a manifestation of God, a creative outpouring of the abundant goodness and love which is the life of the Blessed Trinity. If we were to live in such mindfulness, our vision would be one of one respect. Gazing on nature, we would see the incarnation of a promise yet to be fulfilled and that we are partners to that promise. We would see Christ is reconciling human beings with nature and nature with human beings. The problem we face is much deeper than the likely devastating effects of climate change; it’s a problem that concerns the loss of our home – with each other, with the universe and in God. A loss which we are only now beginning to comprehend. The word ‘ecology’ comes from the Greek ‘oikos’, meaning our home; we need an ecology which recognises our ‘belonging’ as part of the universe and belonging with each other in God. 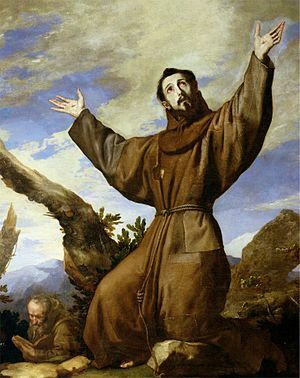 Francis of Assisi, with his sense of abundant giftedness, his recognition of brotherhood and sisterhood, offers an ecology which brings together the environmental, the societal and the spiritual. Such an integrated ecology is one that can lead us to a radical re-orientation – a revolution in our thinking, our living, and our praying, that will be the emerging Christian wisdom for a global future. I believe that all creation has intrinsic value as God is the creator and lover of all that is. We have become lured away from this central truth in our lives and as a consequence we are facing a growing ecological crisis. But the threat to our wellbeing is not only external. The ecology of our souls has been pillaged, raped, defiled, plundered and exploited by the materialistic powers of this world. Like the physical ecosystem, our souls need to be restored (Michael Leunig, quoted in David Tacey, The Spirituality Revolution, p.220). How we approach these interconnected crises should be an expression of our spirituality because it is spiritual impoverishment that brought us to this wilderness place where we have become disconnected from the enduring values of the sacredness of life, our responsibility for the care of creation and a right relationship with our Creator. We have become attached to things, not just for perfectly good reasons of utility, but as a means of defining our identity. Materialism has become a condition of the mind. We are aware that undesirable changes are taking place to our environment but we are too ready to seek out technological solutions to this crisis because our materialist mindset hustles us along this path, whilst ignoring the intensifying detriment to our spiritual lives. Our sense of foreboding has been muffled by well meaning but minor lifestyle changes. We proclaim a ‘green gospel’ of tree planting and recycling, incanting the ‘reduce, reuse, recycle’ mantra but this environmental ethics is founded on utility, whereas it is a change of heart that is required; a conversion that will free us from the regressive cycle of over-consumption and the destructive patterns of behaviour that imprison us. As a member of a liturgical church, it should come as no surprise that I place particular emphasis on liturgy and sacrament, as well as pastoral care. But I am also called to social justice activism because the poor communities who contribute least to the causes of environmental and climate change are currently the most affected. And I am seeking a balance in our economics for economic life has to be situated within the broader framework of the needs of the earth as well as humanity. The direction of travel should start with a spiritually enriched society because when we meet others possessing an inner peace and a more holistic vision we too will want to journey with them. Evelyn Underhill emphasises that we need to find “the centre of the circle first” because “it is at the centre that the real life of the Spirit aims first; thence flowing out to the circumference (The Life of the Spirit and the Life Today, p.227). In other words, the spiritual and religious flows out into moral practice because within this vital energy we find inspiration in the the laments of the Psalmist to respect the earth, the dreams of Isaiah, and the visions of Jesus for the poor and the marginalised, urging us on the path that will lead us out of the wilderness.